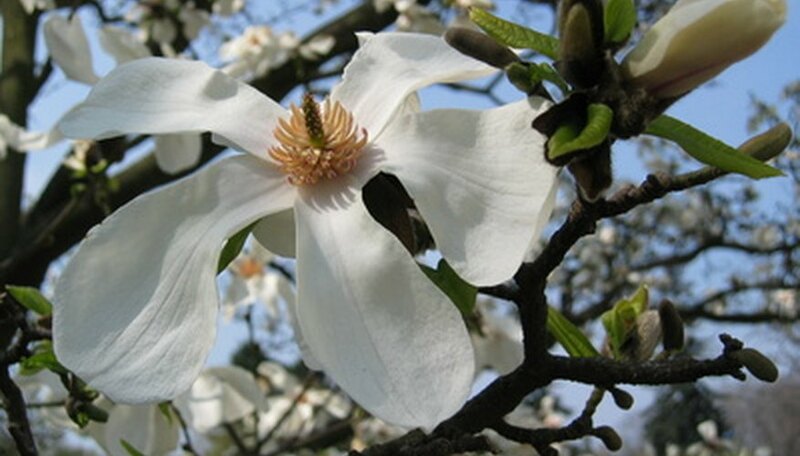 A Magnolia is a type of flowering tree that produces blooms of white and pink buds. Magnolia flowers are robust but elegant, with long wide petals and a column in the center of many stamens and pistils. When drawing a Magnolia flower, remember to use long, graceful pencil lines. Draw with confidence, and avoid creating sketchy lines. For a more realistic interpretation of a Magnolia flower, look at a photograph or another drawing of a Magnolia. Draw a vertical oval with pointed ends. This is the center of the Magnolia blossom (the part with the stamens on it). Draw the petals to the right and left of the shape you drew in Step 1. Start drawing these petals from the bottom of the center part of the flower. The petals will reach out from the bottom center of the flower in a diagonal direction, consistent with the direction that petals open when a flower blooms. The shape of these two petals will be similar to the shape you drew in Step 1, but this shape will be sliced in half the long way, so that the edge farthest from the center is curved and the edge of the petal closest to the center is a straight line. These petals will be slightly taller than the shape you drew in Step 1. Draw the outer petals, to either side of the petals you drew in Step 2. These petals will again be a tall pointed oval cut in half (length-wise), with the straight edge closest to the interior of the flower and the curved edge facing the outside of the flower. Draw the petal closest to the viewer. This will be represented by the bottom-half of a circle, drawn over the bottom of the center of the flower. This half-circle will cover up the pointed end of the shape you drew in Step 1. Once you have drawn this shape, erase any marks you can see through the shape that you may have drawn previously, to give the petal the appearance of being solid. Shade the center shape of the flower (the shape you drew in Step 1). You may also color the center shape, instead of shading it. Most Magnolia blooms are yellow in the center. You may leave the petals white, or shade them a light pink color that becomes darker toward the center of the flower. Use a colored pencil.